What we mean by this is that for most things in life, you get do-overs. As a recovering perfectionist, I can tell you that striving for perfection not only can drive you crazy, but waste precious bandwidth that could otherwise be allocated towards way more fun adventures! Engage your kids in chores. Lots of parents are hesitant to do this (particularly as kids get older and have increasing homework and extracurricular loads), but chores are crucial for family systems. They’re also a multifaceted win: chores teach kids life skills they will need to have when they leave the nest, help kids become a part of the family system, and lighten your load. Also, start ‘em early. We’ve already taught our two-year-old to bring her dish to the sink after dinner and she knows how to wipe up messes! I am a huge, huge fan of FashionABLE, a company I visited when I traveled to Ethiopia with ONE Moms. FashionABLE works to lift Ethiopian women out of poverty and prostitution by teaching them a sustainable trade. Simply buy a scarf and you’re supporting these women (100% of the proceeds from scarf sales go back into the program). 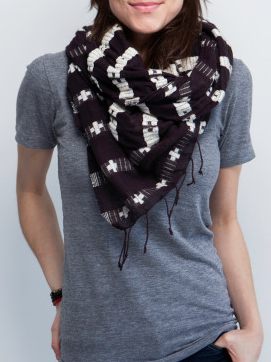 This Genet scarf was designed specifically for Mother’s Day via a design blogger competition at Alt Summit. Check out her design work, consulting and social good endeavors. Peruse her photos on Instagram.